Recent evidence suggests that the first settlers may have been just as likely to hunt small game, catch fish or gather plants as they moved through more temperate environments. The natives of America, back to their earliest appearance on the New World scene, are of the species Homo sapiens, or modern man. No living fossil apes are known in the Western Hemisphere, as they are in the Eastern Hemisphere, nor are more primitive examples of man in the Americas. This basic finding means that man did not evolve from lower anthropoid forms in the New World. It also means that man did not enter North America until Homo sapiens had developed and was wide spread through the Eastern Hemisphere. Since prehistoric man had limited methods of transportation at his disposal, he must have entered by the easiest and shortest route. The only region of t he New World which lies in close proximity to the old is that which is adjacent to the Bering Strait. 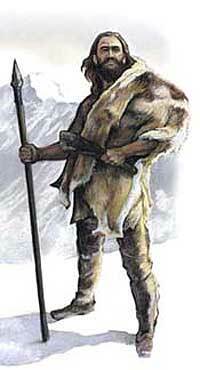 Man could have crossed the Bering land bridge during much of the Pleistocene. In addition he could have crossed on the winter pack ice even when the land bridge was severed. Finally, early man may well have had knowledge of light craft and could have negotiated the open strait. It is impossible to say when humans first conceived the idea of water transportation. Boats of many kinds were in use all over the world long before the beginning of recorded history. A critical factor in the arrival of man in North America seems to have been the existence of an ice free corridor in Western Canada. Analysis of the soil and rock formations proves that a fertile, relatively warm corridor first emerged from the ice along the Alaskan coast in the Yukon, Mackainze and Frasier River valleys and southeast of the Rocky Mountains. We may suppose that successive waves of immigrants from Siberia pushed down the corridor into the interior of America. It should be understood that the Americas were not settled within a short period of time or by a single group of people. Migration consisted of a slow prolonged spread of successive waves of people. It would seem logical to assume that the early immigrants to theses shores (perhaps including Cuba) came as hunters pursuing large game. From the evidence of the mammals which the first arrivals hunted and the geological background of the time when they arrived we may date the entry of humans, the Paleo-Indian, into America around 40,000 years ago.